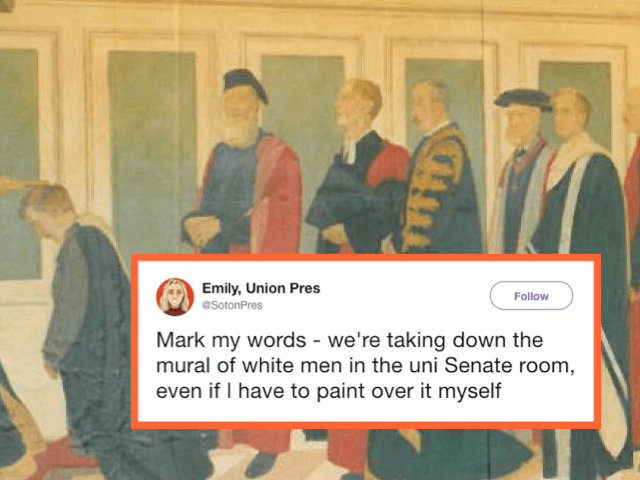 An elected student leader has demanded a mural commemorating students who died fighting in the First World War be destroyed, berating the fact those depicted are “white men”. Emily Dawes, the president of the University of Southampton Student Union, vowed to vandalise the memorial unless it was taken down. The mural, displayed at the heart of the leading university’s campus, depicts fallen soldiers — who were students before they left to fight in the Great War — picking up the degrees they did to live to finish. The Rothenstein Mural was unveiled in the University’s Senate Room in 2014 and was “painted in 1916 as a memorial to members of the British universities serving in the Great War”, according to the institution’s website. ‏It was painted by Sir William Rothenstein, former Principal of the Royal College of Art, and presented to the University of Southampton in 1959 by the artist’s son, Sir John Rothenstein. Campaigner and journalist Martin Daubney blasted: “So many men died in WWI we don’t know the true number. Some say 20 million deaths, and most of them were white men. Presenter and writer Andy West urged the university not to “cave in to this sad, cynical, fanatical insanity”. 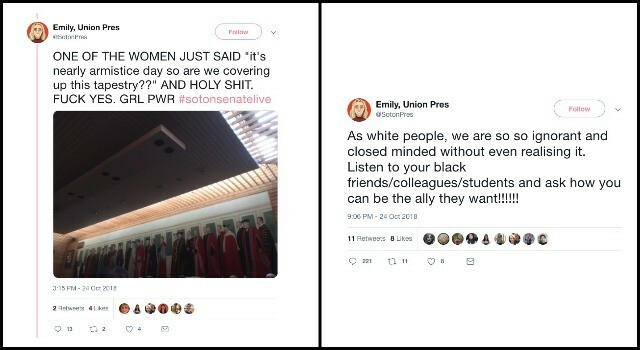 Breitbart London contacted the Student Union to ask if the organisation supported Ms Dawes’ statement but they had not replied at the time of publication.